The AAL Forum 2016 took place in St. Gallen. 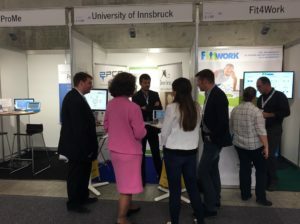 The University of Innsbruck had a booth at the forum. At this booth FairCare was presented with posters and flyers. Furthermore, a FairCare presentation ran on the screen on the booth the whole day. 28 exhibitors and circa 300 congress participants were at the forum.